Alongside their famous foundations and bronzers, Bourjois are probably best known for their little blush pots. Last year they launched a cream version and for summer 14 there are 2 new Sun cream blushes. Both warm toned with one leaning more towards the bronze side and one with a touch of coral (shown above is shade 05, the more bronze of the two). Of all the new launches these are probably my favourite. The cream formula is quick and easy to apply, leaves a dewy finish on the skin and I love that the little pots are study enough to throw into my handbag, perfect for touching up during the day. 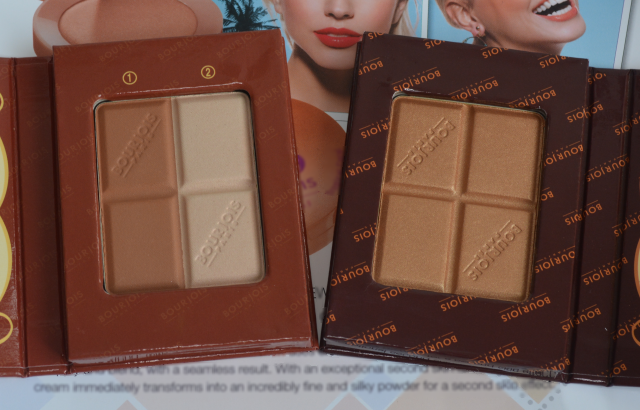 Bourjois are also expanding their much loved bronzing range with 2 new powders. There's a Delice de poudre bronzing duo which combines their best selling bronzer with a shimmery highligher, as well as a new Delice de poudre bronzing powder which has a touch of shimmer and doubles up nicely as a golden eyeshadow. Both come in the famous chocolate bar compact and will no doubt be best sellers when they launch later this month. 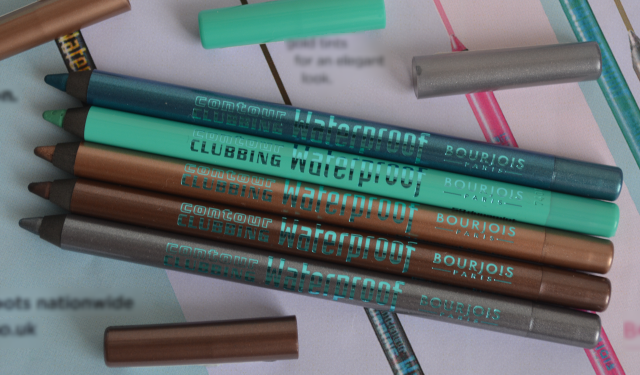 Finally not one to shy away from colour there are some beautiful new Contour clubbing waterproof eyeliners. The formulas are creamy and long lasting with a choice of either a matte or shimmery finish. Luckily for every day wear there are some gorgeous browns too which helps to define and thicken the eyelashes without looking too heavy or made up. Are you a fan of Bourjois make up? Have any of the new launches caught your eye? You got some lovely colours in the pencils - they look so pretty together! Love that minty green one!